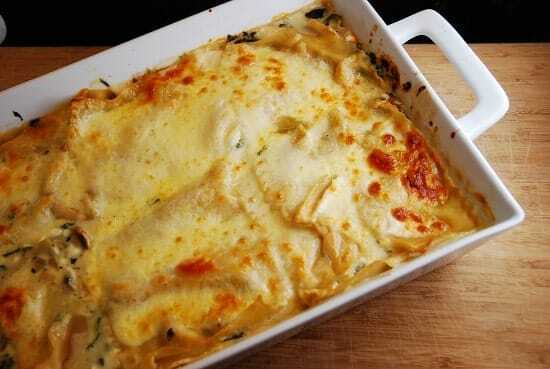 Spinach and mushroom lasagna is one of absolute favorite dishes. It’s loaded with good for you ingredients and is so cheesy and creamy. But aside from the fact that this dish is made with healthy vegetables, most traditional Spinach and Mushroom Lasagna Recipes can be loaded with extra fat, calories and carbs. So I played around with the ingredients, and created my own take on this popular vegetarian lasagna. My healthier, lower calorie version is nothing short of delicious and boasts just 8 Points for a very nicely sized serving. It still has all the creamy, cheesy goodness that you’d expect, but with a lot less of the fat and calories. Using whole wheat lasagna noodles also helped to add in additional protein and fiber, so this ends up being one pretty filling meal. The bechamel sauce is key in this Weight Watchers lasagna recipe, so make sure to get the texture just right. Start by adding in the milk, and then very, very GRADUALLY add in the broth. You may not need any, or you may need it all. But you just don’t want the sauce too thin, or too thick. If it’s too thin, just whisk in a little extra flour. This dish does take some extra effort, I know, but it is soooooo worth it. Enjoy! This classic vegetarian lasagna recipe gets a healthy makeover, delivering a hearty and delicious portion for just 8 Points. Creamy, cheesy and delightfully flavorful, this crowd pleasing lasagna will make a wonderful and satisfying family dinner. Bring a large pot of water to a boil, and blanch spinach until cooked, about 10 minutes. Drain spinach and rinse under cool water. Squeeze out as much water as possible, and set aside. Spray a large, sauce pan or pot with not fat cooking spray and set over medium high heat. Add in mushrooms, and a pinch of salt, and cook until mushrooms begin to lose their water, about 3-4 minutes. Remove from pan and set aside. Add butter to pan, set over medium high heat, and let butter melt. Add in onions and cook, while whisking, until onions are soft, about 3-4 minutes. Next, add in the flour and cook – keep whisking. Gradually add in the milk and broth, and bring the mixture to a boil over med-high heat. Keep whisking it. Add the oregano, nutmeg, ½ of the salt and pepper and simmer over low heat for about 10 minutes. Whisk it on and off. Once the mixture becomes thick and saucy, whisk in the Parmesan cheese, and stir until melted. Set aside about 1/2 cup of the sauce and in the remaining sauce, whisk in the spinach and mushrooms until well combined. In another bowl, combine ricotta, garlic, basil, and remaining salt and pepper. Preheat oven to 425 degrees, and spray a large casserole pan with non-fat cooking spray. Pour the reserved 1/2 cup of the béchamel sauce on the bottom of the casserole dish, and spread it out evenly. Now place in one layer of noodles, lying evenly side by side to cover the bottom of the casserole dish. Now spread in about 1/3 of the ricotta mixture over the noodles , and then about 1 cup of the spinach mixture on top of the ricotta. Continue the noodles, ricotta, spinach/mushroom mixture until they are all used up, and making sure that the top layer is the spinach/mushroom. Cover the top with foil (grease the inner side of the foil with some oil so that it doesn’t stick to the cheese). Bake for about 20-30 minutes, or until the lasagna starts bubbling. Then remove the foil, and place back in oven, letting it cook until cheese is browned on some spots, about 10-15 minutes. Remove from oven and let cool for 10 minutes. Cut into 6 equally sized portions and serve. Depending on how your bechamel sauce thickens, you may need more or less broth. Start by adding in the milk first, and then the broth last, and very, very GRADUALLY. It was good, but WAY too much basil. Definitely will cut down on that next time. I LOVE this! I made a couple small changes, though. I’m really trying to stay away from wheat, so I used THINLY sliced peeled eggplant intend of noodles. You can’t even tell! I had no fat-free milk, but I did have fat free condensed milk. I add a little water to it to make 2 cups. I think it tastes really rich. Thanks again for a great recipe! LOVE the idea of the eggplant instead of noodles – genius! I made this Sunday night & adapted it from Emeril’s recipe in pretty much the same way. It’s really good & totally worth the extra effort! This sounds delicious….thank you for sharing your recipe!